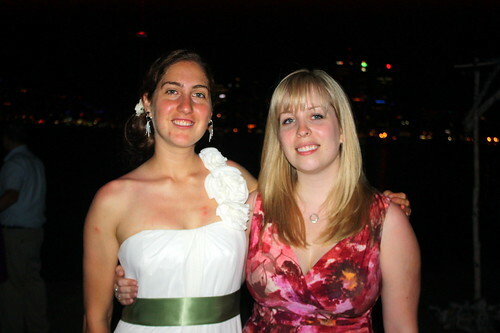 This weekend, Garrett and I headed to our friends’ wedding on Algonquin Island in the Toronto Islands on Lake Ontario. The night before, my mother and I worked on the centrepieces. We used a combination of flowers from the garden, the wild and local greenbelt florists. I have a great tutorial lined up for later this week! 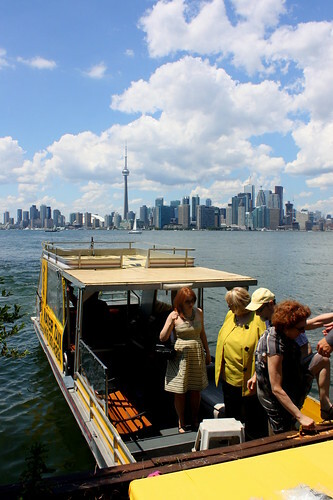 To get to the islands you have to take a ferry or a yellow water taxi like we did. 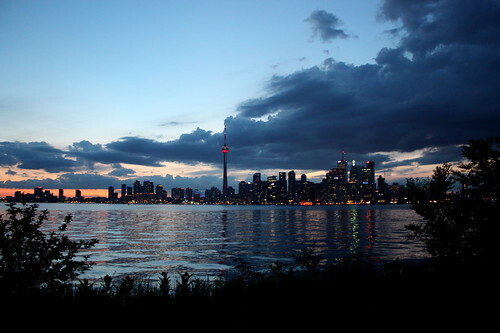 You can see the city across the lake. 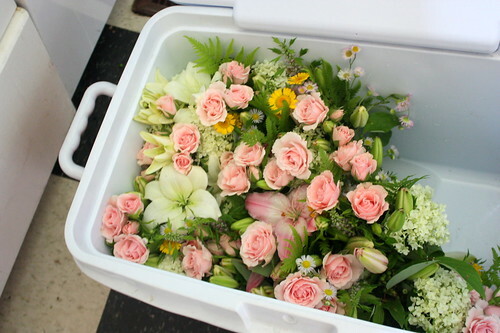 I packed the flowers in a cooler before I left my parents’ house and thankfully they survived the trek! 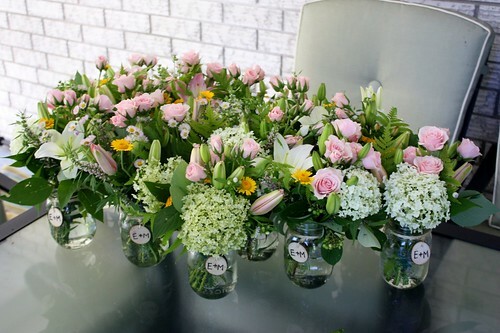 All I had to do was refill the jars with water and then carefully place the bundles of flowers into them. 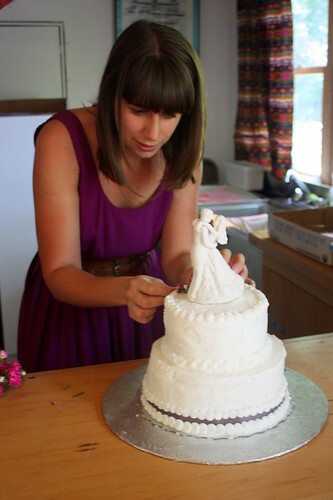 Shannon of moosejones was busy setting up the cake she made. 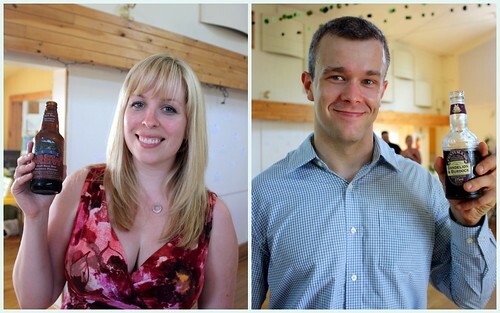 It really was a DIY wedding with lots of family and friends helping out. 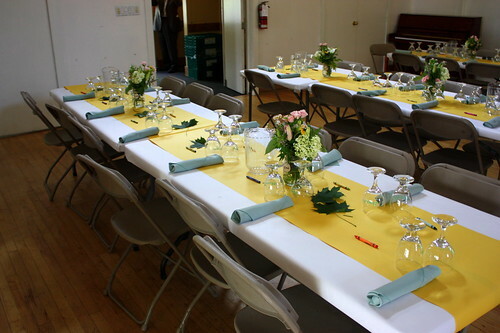 The tables all set up. You may recognize those napkins from the boxed lunches we made for the “Save the Oak Ridges Moraine” Train Ride my family worked on a few years ago. These napkins have been to tons of events over the last few years and have saved many a paper napkin from ending up in a landfill. 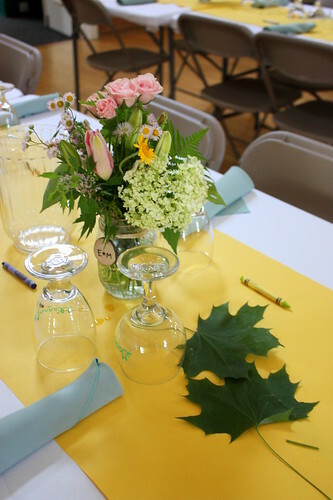 The centrepieces ended up working great with the yellow table runner, with the little yellow flowers being a lovely pop of colour. 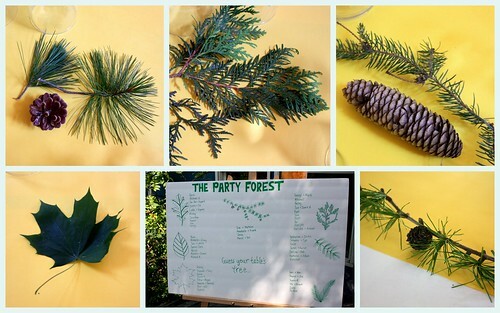 The bride and groom are big wildlife enthusiasts and instead of doing the traditional numbered tables, they decorated each table with the needles or leaves from a specific tree. Guests were welcome to identify with tree for the table they were sitting at. Can you guess them all? 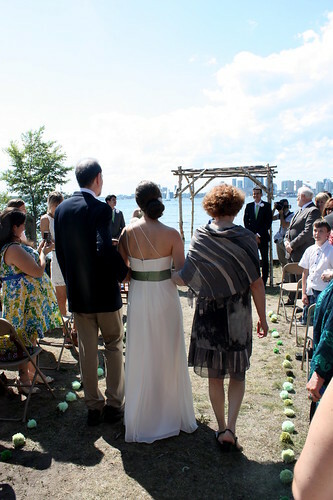 The ceremony was set out overlooking the city skyline. 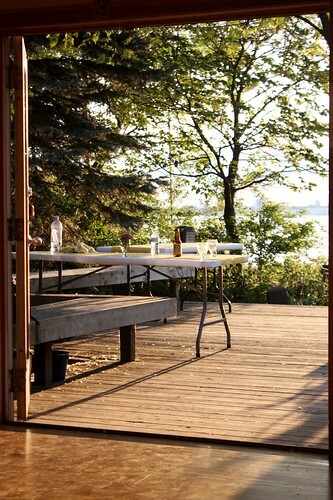 It was so quiet on the island and was hard to believe that we were only a short ride over to the hustle and bustle of the city. 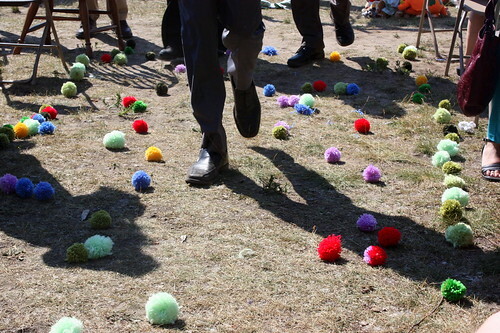 The aisle was lined with fuzzy homemade yarn pompoms. 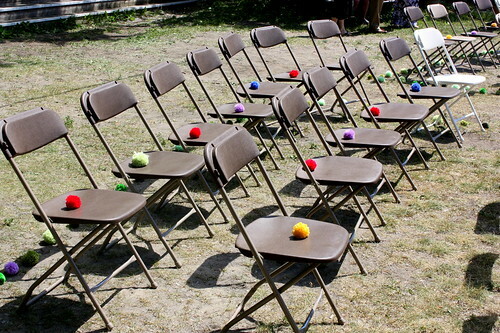 Each seat at a pompom placed on it as well for guests to throw in lieu of confetti. I was aimed and ready to fire! 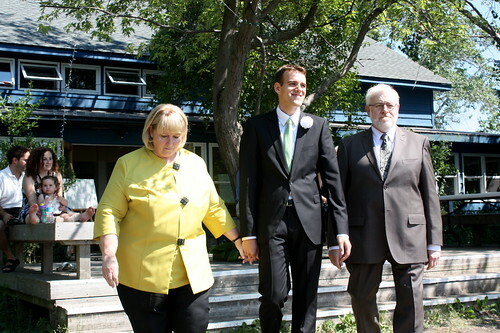 The handsome groom, Mat, with his father and stepmother. 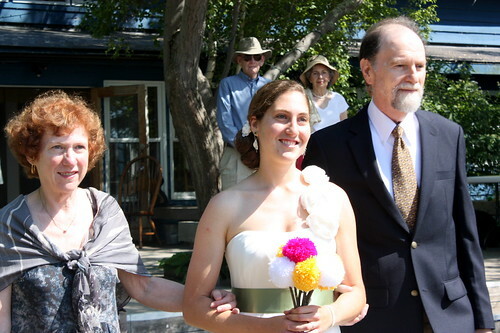 My dear friend Eve looked beautiful as she walked down the aisle with her parents. 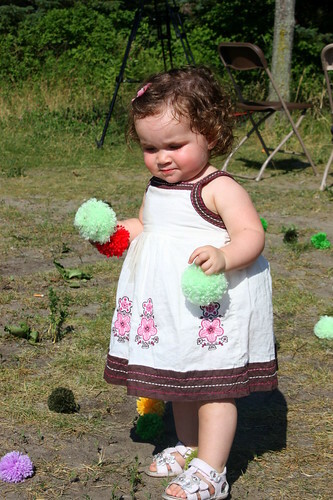 Her bouquet was made out of pompoms as well, glued onto sticks. They turned out great! I always love it when you can get a picture of the groom seeing his bride come down the aisle. So sweet. 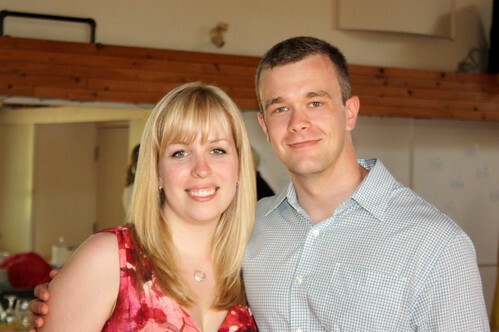 Especially for these two, who have been together for 7 years. 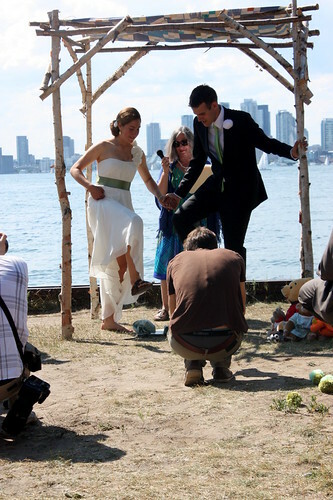 The ceremony was very fun and playful, just like this couple is. There was many jokes, some funny props and even a few super sweet moments when I may or may not have gotten a little bit weepy. 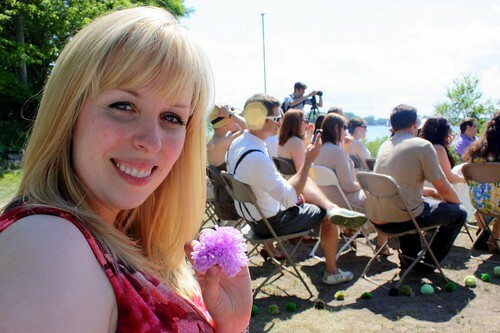 I’m a sucker for weddings. The beautiful structure they are under is a chuppa, which is part of Jewish tradition. It was made out of silver birch by some of their friends. 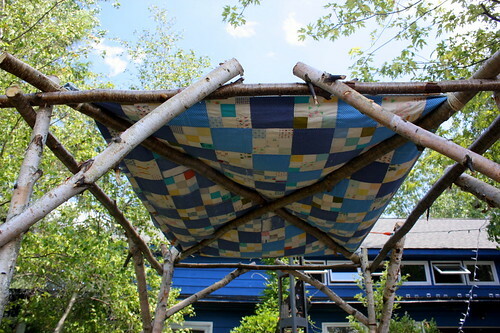 The canopy was made my Mat’s late grandmother. 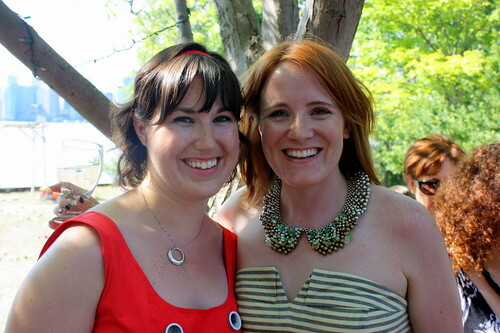 A sweet reminder that she was there in spirit. They also did the tradition of breaking a glass at the end of the ceremony. Mazel Tov! 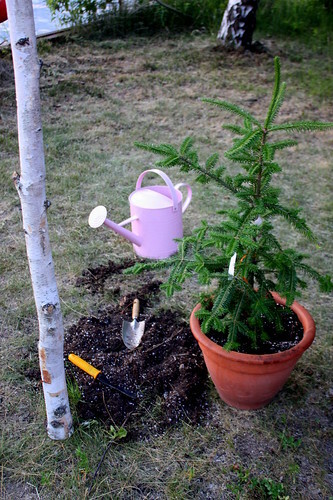 And as true outdoor enthusiasts, they also planted this little tree. 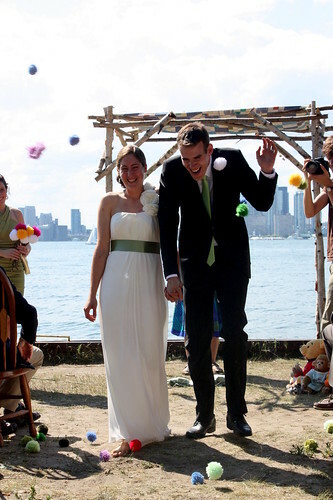 After they kissed, everyone cheered as they came back down the aisle – and pelted them with pompoms! …and started hurling them at me. 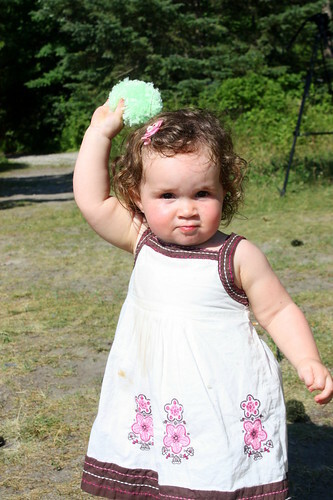 She’s got a good arm! The reception started with a trip to the bar. 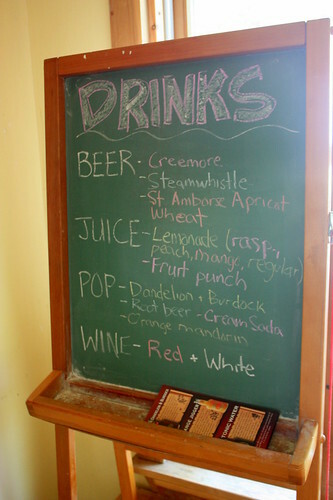 They had some great beers and wines, as well as some fun juices (mango lemonade!) and some fun pops I’d never even heard of. I tried the all-natural root beer and Garrett gave the dandelion + burdock pop a whirl. It kind of tasted like really sweet black licorice. I would have also liked to try the vanilla cream soda or orange mandarin. 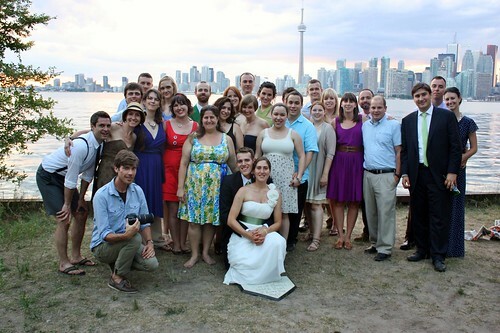 The wedding was a great chance to catch up with some of my Toronto friends who I haven’t seen much since the move. I love hanging out with these girls! 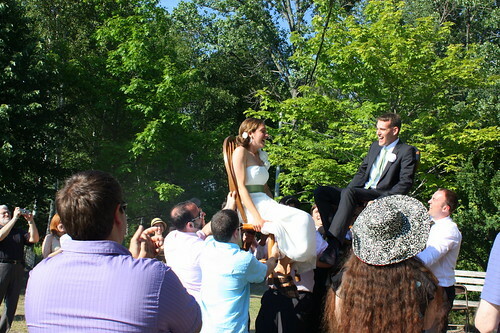 After an outdoor version of the Horah, the bride and groom were tossed up on chairs. It looked fun…and terrifying all at the same time. 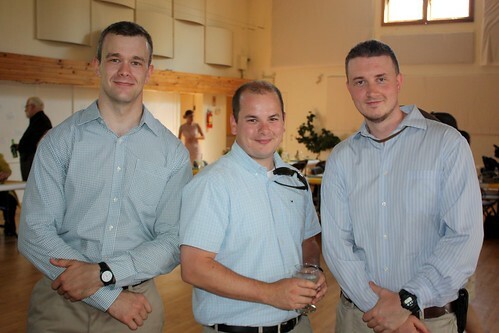 The wedding was a pretty casual affair, so there were not many suits there, but there did seem to be plenty of guys in blue shirts and khakis. We just had to pull some of them together for a photo op. 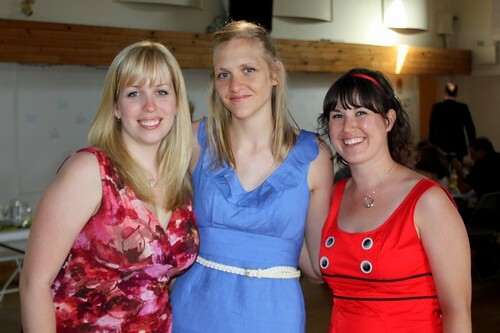 Us ladies didn’t get the “dress alike” memo. 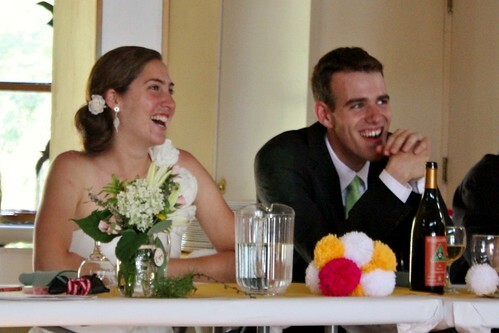 Throughout the whole evening, the bride in groom were constantly laughing and smiling. They both seemed to be having a great time. 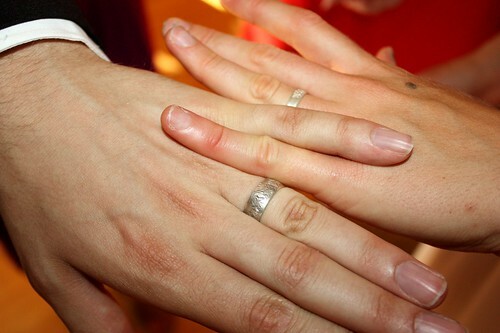 I had to show you a quick picture of their rings. They went to a workshop a few weeks ago and made each other their own rings. His is hammered all around and hers has a little bit of hammered metal in the middle as her “bling”. Such a unique idea! The sun started to set and the warm light poured into the building. 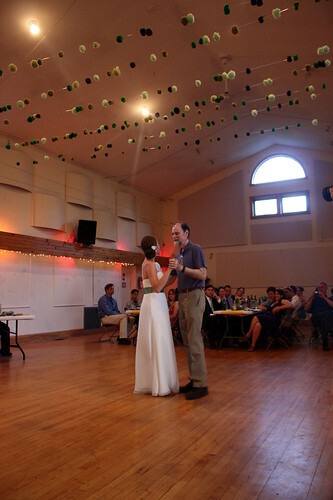 Father-daughter dance under a canopy of pompoms. The final result of the cake that Shannon made. 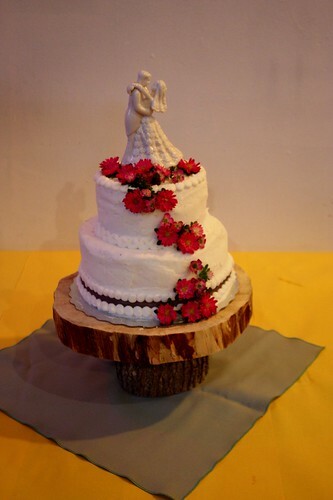 Real flowers cascading down to a wooden cake stand that my brother and I made. I’ll have a tutorial on that soon! 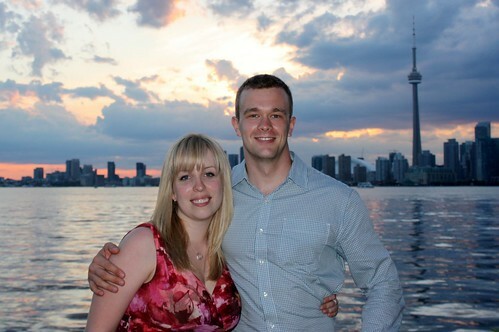 We took a little stroll along the lake after dinner. It was so peaceful on the island without any cars around. 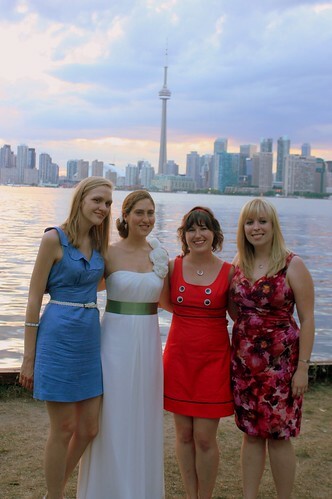 The “friends” photo – some old, some new. It was a great night with a fun group of people. 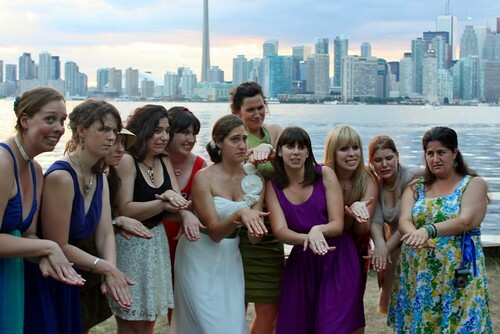 All the ladies. 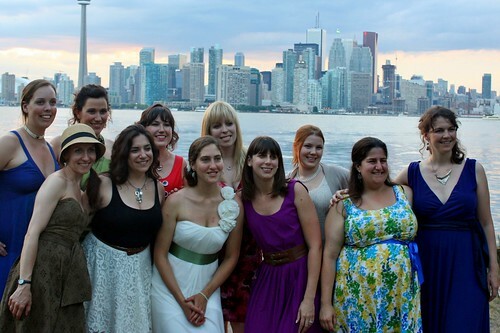 Some of us just met at the bachelorette weekend, but it feels like I’ve known them for longer. We’re already planning a craft night together! 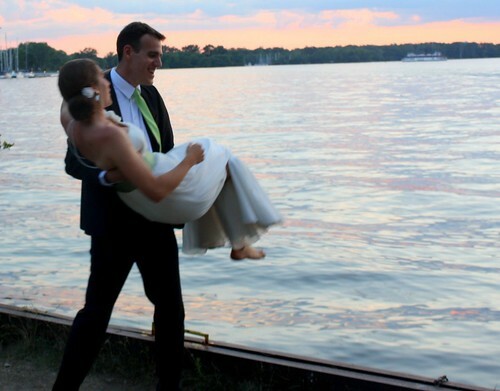 The groom tossing the bride in the water. Don’t worry – he didn’t actually do it. 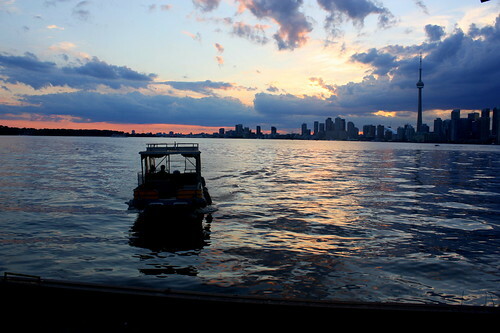 Some people started to head back across the lake on water taxis just as the sun almost finished setting. 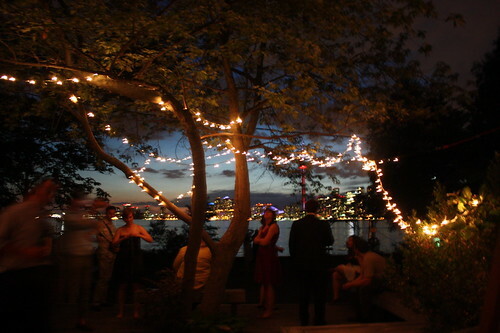 While many of us stayed to dance the night away under stars and twinkling lights. 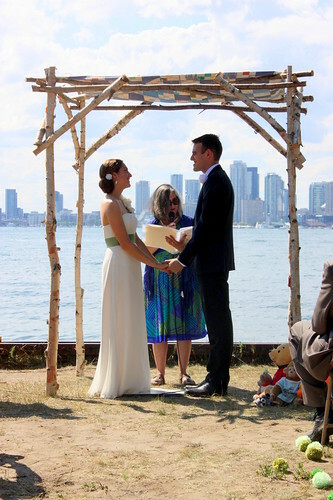 It was so great to be there and share this special day with Eve and Mat. They made is fun and playful, just like they are. 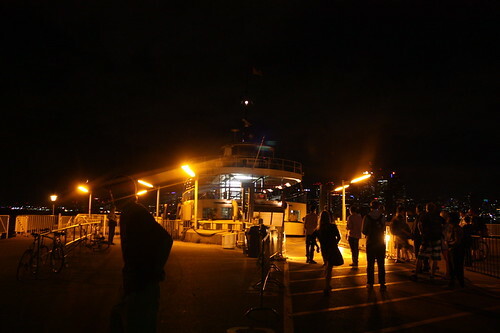 We decided to head back on the ferry, so that we could watch some of the city as we rode back. It was a great night spent with some really fun people and I have to admit that it made me miss Toronto just a little bit. Not enough to move back, but enough to appreciate all the wonderful things this city has to offer – especially the people. 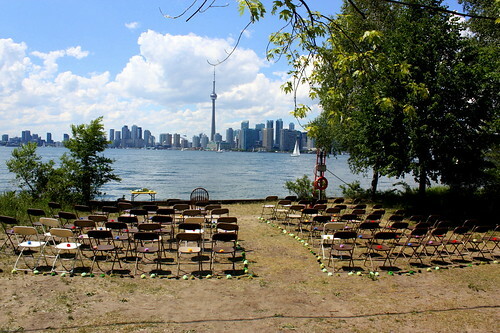 What a beautiful setting for a wedding! Loved the centerpieces you made! Dear Frankie and Annabel, your little “Pumpkin” is all grown up! Couldn’t agree with Shannon more… what a great post indeed! 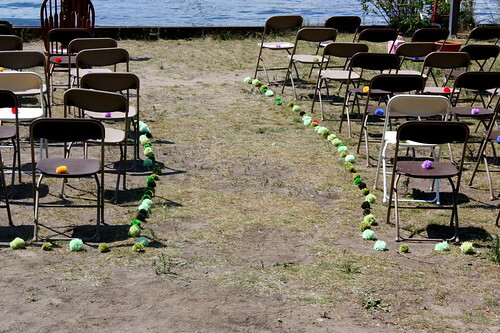 Awww, your wedding is so cute and romantic. Those flower centerpieces are so lovely; I admire your eye for art and design. 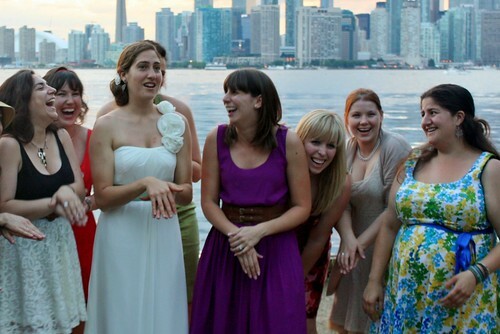 I love your venue, with the cityscape at the background. It looks so, cool. I hope that I hope that when the time comes and my boyfriend shops for perfect diamond rings online, he will follow it up with a cool wedding such as yours. 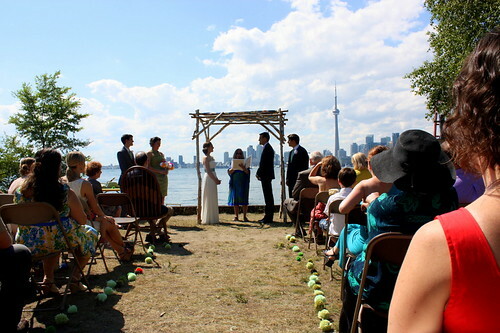 Hi, just wondering which building/venue was used on the island? Looks wonderful!